Last night while watching the news I heard a report of a new scientific study out of Israel about the protective effect of sunscreens in the prevention of skin cancer. Mice with their hair shaved and their skin heavily protected with sunscreen and then exposed to ultraviolet light still developed the skin mutations that develop into melanomas. It’s summertime – the time we like to spend at the beach or out by the pol, or working in the garden, or hiking in the mountains – sunlight feels good, increases our serotonin levels and our melatonin levels and our vitamin D levels and gives us a healthy looking suntan. But that ultraviolet sunlight can damage our skin. The short wavelength UVB releases its energy first damaging the epithelium, the surface layer of cells that make up your skin. The longer wavelength UVA penetrates deeper into the dermis of the skin and does its damage there. For a sunscreen to be effective it must protect against both UVB and UVA — they are both damaging. But according to this latest study from Israel, even good coverage of the best sunscreens still does not prevent the development of the mutations leading to melanomas. And, who actually uses sunscreens as directed? First, many sunscreens do not have a high enough SPF rating to give any reasonable protection. But even if you’ve got one with a high SPF rating, we find that most people only apply about 25% to 50% of the amount used in the actual SPF testing, so they are not getting the SPF protection listed on the bottle. And, they are not consistently reapplying it during their exposure. And, now we find out that even with good coverage we will still get the mutations. For several decades, we have been warned about the damaging effects of the sun on the skin and sunscreens are now extensively used by those in the sun. And what are the results of two decades of sunscreen use? Skin cancer has not decreased, it has significantly increased in spite of all the sunscreens. There is even some concern regarding one of the main sunscreen ingredients: PABA (para-amino-benzoic-acid) that it is itself carcinogenic. There is an alternative line of thinking on this issue: Is it exposure or susceptibility? Is it the deterioration of the American diet and our subsequent increasing susceptibility to cancer that is leading to the increased cancers from our sunlight exposure? There is increasing evidence to say yes. Every cell in your skin has a cell membrane made of phospholipids made out of fatty acid molecules, and the internal structures of every skin cell are made of these same phospholipid membranes: like the mitochondria, the endoplasmic reticulum, the Golgi bodies, the nuclear membrane. These various cellular structural membranes made of fatty acid molecules are highly susceptible to ultraviolet radiation damage. These membranes need to be protected. What are we building our cellular membranes out of? Animal fat and refined vegetable oils make up most of the fat content of the American diet. These refined oils are totally depleted of the protective antioxidants found so abundantly in the whole plant foods. And, so this is the material our cells have to work with as they build our skin cells. Vitamin E as well as hundreds more protective antioxidants of various types are removed, and we build membranes with absolutely no protection against oxidative ionizing UV radiation. So when hit by a photon of sunlight, a fatty acid molecule in the cell wall is oxidized into a highly reactive free radicle which spreads its damage by a chain reaction from molecule to molecule. And, it can spread to a DNA molecule in the nucleus creating a mutation. But, what if the only fat in your diet came from eating an avocado or a walnut or a sunflower seed? very natural source of fatty acids in the plant world is full of vitamin E as well as hundreds of other protective molecules. So as cell membranes are built up, they are now fully saturated with these protective molecules. So now if a photon of sunlight hits a fatty acid molecule, the very next molecule this free radicle bumps into is a vitamin E that acts just like a fire extinguisher totally stopping this destructive chain reaction so that no significant damage is done. For some reason (I am not sure why), scientists started researching the internally protective effects of a tropical fern called Polypodium leucotomos. 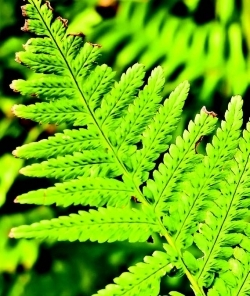 In the phytochemicals of this fern, there are substances that inhibit matrix metalloproteinases. These are enzymes that breakdown elastin and collagen — important structural components of your skin. So inhibiting these enzymes has a protective effect against the sun’s damage. Extracts from this fern also inhibit ultraviolet light damage to the microfilaments — important structural components inside of the skin cells. They also prevent sunlight-induced mislocation of adhesion points between cells. They also stimulate the production of more elastin and collagen and a substance called TGF-beta that activates a number of important signaling pathways in these skin cells. These extracts also have a powerfully effective protective effect on fibroblasts — the cells that make collagen and elastin as well as the extra cellular matrix of the skin. Thus, we find natural plant substances that can actually repair sun-damaged sin. 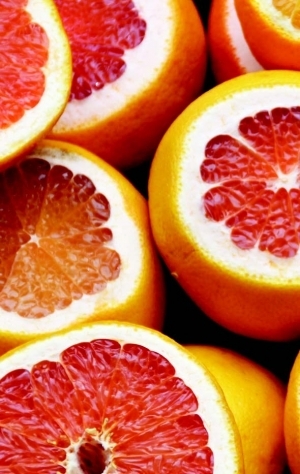 Then, somebody studied red oranges and found anthocyanins, flavanones, hyroxycinnamic acid and many other phytochemicals that had powerful sun protective effects. They inhibited the growth of human cancer cells and inhibited cell death from UVB rays. They had powerful anti-inflammatory effects and were shown to reduce sunburn damage. And of course now you can buy these fern and red orange extracts as supplements. But, what about the thousands of other plant foods that are also full of all these and similar phytochemicals? Around six hundred to over a thousand phytochemicals are found in almost every fruit studied. We are just beginning to touch the edges of understanding what all these are in there for. But, it seems God has provided an overabundance of solutions to almost everything that a human cell could need. We were designed to live in the light and experience the benefits of serotonin, melatonin and vitamin D. (Sunlight actually stimulates healthy skin growth.) And, the diet our Creator gave us was designed to protect us from any damage from the UV rays. Today, most foods are refined, depleted and full of toxic carcinogenic compounds and have none of the lifesustaining substances God intended for us to have, and so our cells are very vulnerable and susceptible to damage. The whole plant food diet provided for us from the beginning by our Creator is the best sun protection you can provide to your cells. If the only food you are eating comes the way God made it, you know that it is full of hundreds of different protective molecules, and the cells you are building will have the best resistance possible to the damaging effects of sunlight. P.S. Do you know what’s the best sunscreen? A long sleeved shirt and a broad brimmed hat!